Sun Sath, a community health worker from the Cambodian Health Committee, examined Yin Ron, 52 with tuberculosis, during a home visit to Pothmei, a remote village in the countryside. Photo by James Nachtwey. 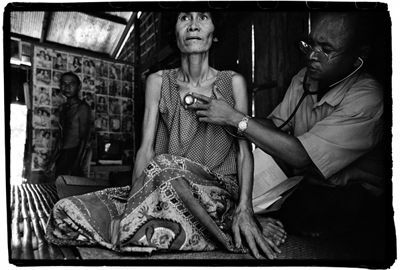 Dr. Anne Goldfeld, Co-Founder of the CHC, teamed up with award-winning war photographer James Nachtwey to publicize the Cambodian Health Committee's efforts to fight tuberculosis and AIDS and the toll these diseases are taking in countries around the world. From February 9 through March 14th, 2008, a Paris exhibit at 'Le Laboratoire', showcased Nachtwey's photographs with text by Goldfeld. In conjunction with the exhibit, Goldfeld delivered a public lecture on February 12. In her talk, TB, AIDS and War: Defying a Dynamic of Neglect, Goldfeld, who is also an Associate Professor of Medicine at Harvard Medical School and the Harvard School of Public Health, described how the CHC has successfully treated tuberculosis and AIDS in some of the poorest communities in the world afflicted by war and conflict. "The message we bring is that the CHC has found ways to treat tuberculosis and AIDS, and restore people to health, despite tremendous obstacles including war, poverty and the displacement of whole groups of people" Goldfeld said. The photography project grew out of an invitation Goldfeld made to Nachtwey, a preeminent photojournalist who has covered conflicts all over the world for TIME and other leading publications. In 2002, Goldfeld asked the photographer to join her in a project that would document, through photos and words, the human toll taken by tuberculosis and AIDS worldwide, and the valiant efforts being made by people on the ground in Africa and Asia to fight the diseases. Nachtwey's initial photo essay, TB in Cambodia, is part of a portfolio that garnered him his seventh Magazine Photographer of the Year award from the National Press Photographers Association. Some of the Nachtwey's subsequent work with the CHC was featured in a photo exhibit at the United Nations in New York in March of 2007, entitled A World Free of TB. The Paris exhibit showed some of that portfolio, plus new photos from all over the world, and an accompanying text by Goldfeld. "I am absolutely thrilled to see this idea that we had back in 2002 become a reality," said Goldfeld. "Jim's stunning photos and the stories of our patients give witness to the ongoing suffering due to these treatable diseases. Once people's eyes are opened to this suffering, I am sure we will find a solution." The event was held at Le Laboratoire, an exhibition space dedicated to collaborations between artist and scientists. Located near the Louvre museum, Le Laboratoire was created by David Edwards, a professor of engineering at Harvard University and author of the book Artscience (Harvard University Press 2008) in which Goldfeld's work is featured. In addition to Nachtwey, Goldfeld, and Edwards, Dr. Michel Kazatchkine, the President of the Global Fund for TB, Malaria, and AIDS spoke at the opening of the photo exhibit. The exhibit was featured in Paris Match and in Time Magazine's Europe edition.